I like playing with words as much as I like playing with food. So it struck a chord when Paper Chef suggested that a fourth ingredient for this month’s challenge — joining lamb, goat cheese and flour — would be an “A” word that evokes August. I immediately started a list: amaranth, angelica and arugula (all currently in my garden), apple, apricot and aubergine (in season here in August), and anise, artichoke, asparagus and avocado (available but from somewhere else). In the same way that a single word acquires meaning in the context of a sentence or paragraph or a whole story, a single ingredient becomes transformed into something greater within a dish or a meal. That transformation – whether in words or in food – is an inherently cultural act. Some people regard basic foodstuffs, especially vegetables and fruits, as nature. To me, any food is culture, as is the combination of words to make literature. We take conscious actions regarding what we eat: whether we forage it from the woods, fish it from the sea, grow it in our gardens, cook it in combinations, serve it to others, consume it ourselves. So as close as we can get to the source, the more we can exercise our own values and not someone else’s, hence our (at least my) preference for less processed, more local ingredients. Food is a great means of communication and connection within our own society and among cultures. The association of Paper Chef’s three chosen ingredients with the idea of a fourth sent me down a particular path. 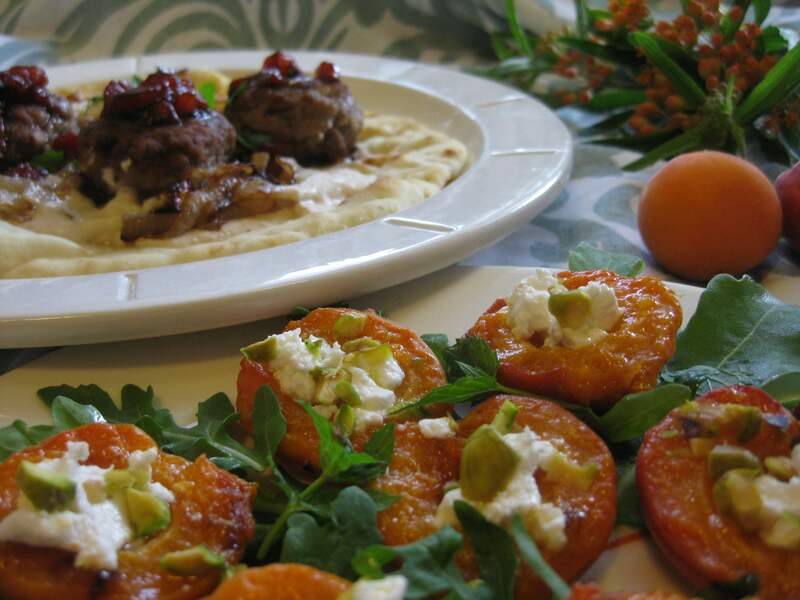 Lamb and goat cheese (though sheep would be more in line with the flock) pair well with aubergines, known here as eggplants, a combination that suggests the cooking of the eastern and southern Mediterranean and the Middle East. The week that Paper Chef #60 was announced, I had already prepared baked eggplant halves stuffed with a tomato and lamb sauce and topped with feta. I also canned an amazing batch of apricot jam from just-picked fruit and had some left over, so I decided that apricots would become the A for August. In preparing this meal, I thought of the Berbers, nomads who carried metal pans that they could heat over fires to make flatbread, the many regional traditions of cooked lamb, sweet-sour pomegranate molasses that I’ve been favoring lately, and serving fruits with meat. Mine are not authentic recipes (in other words, I did not learn them from people of the region who’ve been doing this for generations) but I thought that they worked in combination and were reasonably close to tradition, at least within my context. 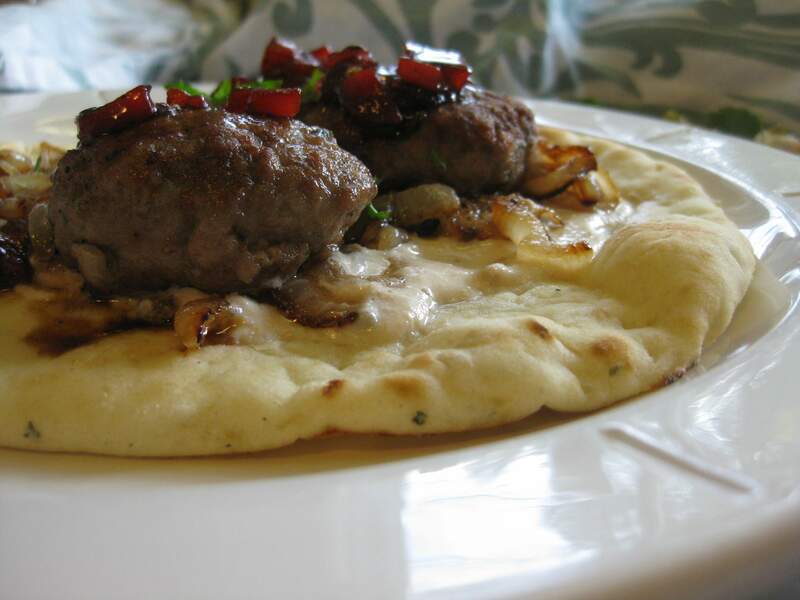 I served lamb meatballs flavored with cumin, Aleppo pepper (Yay A) and mint on flatbread that was coated with yogurt-tahini sauce and caramelized onions, and topped with a relish of red pepper and pomegranate molasses (a simplification of a traditional muhammara, which I thought would be too rich). 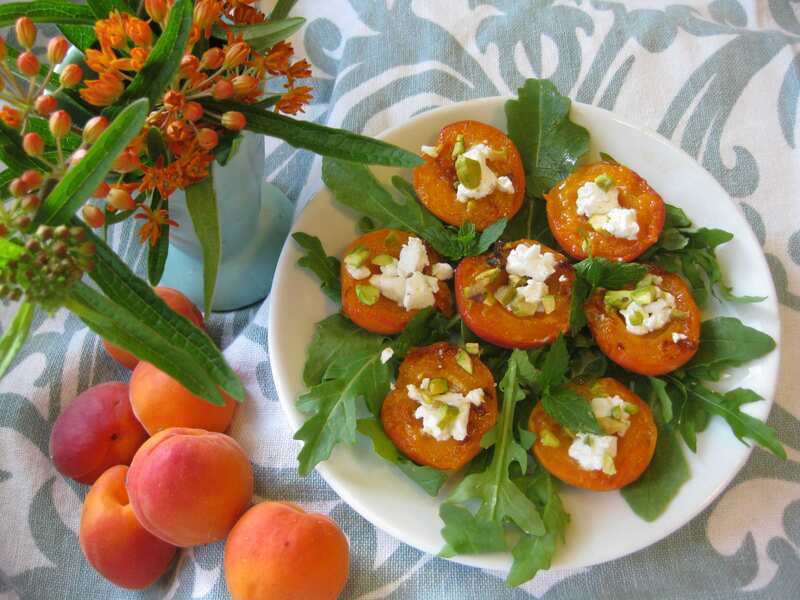 The side dish was composed of pan-grilled apricots with goat cheese and pistachios served on top of chopped mint and arugula (another A word). Delicious. Crumble the lamb lightly in a mixing bowl. Break the bread into small pieces and soak it in milk or yogurt until soft. Squeeze out excess moisture and add to the lamb. Add the onion, garlic, cumin, pepper, mint and salt, combining thoroughly but lightly. Form the meatballs into ovals about 1 x 1 ½ inches and set aside for a few minutes (in the refrigerator if longer) to set. Preheat the oven to 350 degrees. Dredge the meatballs in flour, shaking off the excess. Brown them in batches in vegetable oil for a few minutes, using medium-high heat, transferring them to a baking sheet as you go. Finish cooking them in the oven for about 10 minutes. Combine all ingredients, stirring to create a smooth sauce. Set aside for a few minutes to allow the flavors to meld. Slice the onion in half through the stem end and then cut it horizontally into ½-inch slices. Saute it slowly in vegetable oil for about 15 minutes until it turns light brown. Add the sugar and continue to cook for another 5-10 minutes until dark and aromatic. Char the red pepper over a gas flame until blackened on all sides. Transfer it to a paper bag or covered bowl to steam for a few minutes. Remove the blackened flesh. Do not rinse. Chop into ¼-inch pieces. Place the chopped peppers in a small saucepan and add a tablespoonful of water and heat the pepper to cook it. Stir in the pomegranate molasses and cook the mixture until thick. Cut the apricots in half along the seam line (pole to pole). Place them cut side down in a hot frying pan with vegetable oil. Cook for a minute or less and remove to a plate. 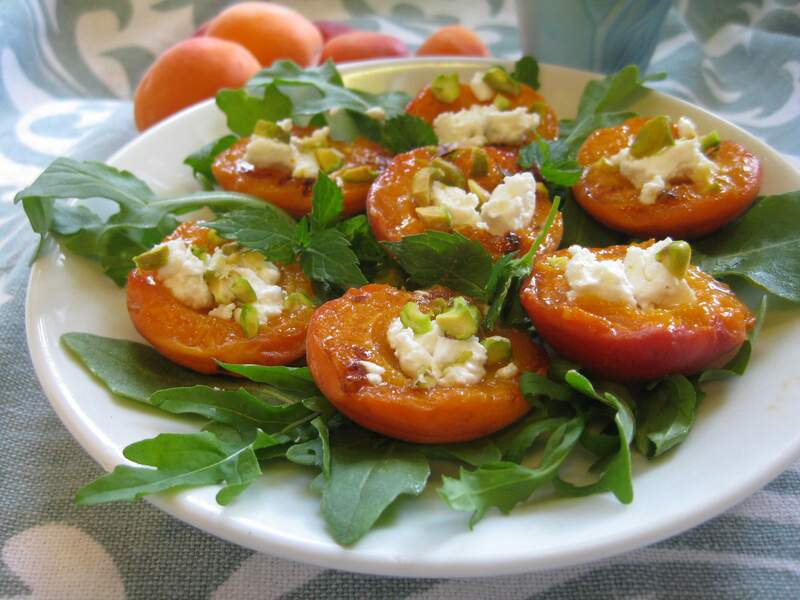 After the fruit is cool, add a small spoonful of goat cheese to the center, sprinkle chopped nuts on top and serve over mixed arugula and mint leaves. The greens can be dressed with a lemon vinaigrette, but I personally thought they were fine with just the juices coming from the apricots.